“Though there are no regular or extensive dairies, almost every family, however poor, has one or more cows” (A Topographical Dictionary of Ireland, 1837). Before the devastating Famine, Leitrim had a much higher population, one which was dependent on the poorly draining soils, mountains and heaths to provide families with the means to survive, and sometimes thrive. Farms, such as they were, supported crops (potatoes, oats and flax), small numbers of cows, with sheep in the higher mountain areas, and occasionally pigs and goats. Since 1837, Leitrim like the rest of Ireland has gone through such changes that a farmer living in the Leitrim described in the Topographical Dictionary would be rightly confused if transported to 2015. 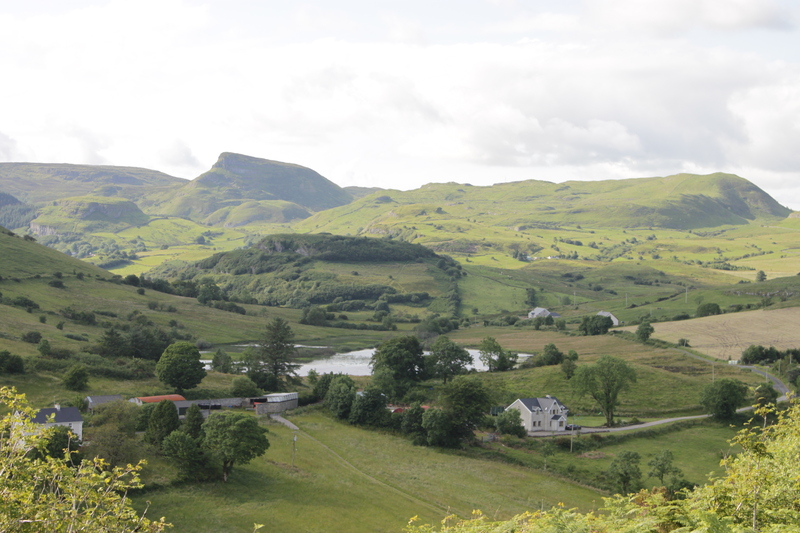 However, they might still recognise the Leitrim farmed landscape. Small fields still predominate on the lowland, in a bocage (mixed woodland and pasture) landscape with a high density of hedges, and the grasslands are predominantly semi-natural or semi-improved. Many families have retained farming as part of their lives, working full or part-time on farms which may have been farmed by generations of their relatives. In 2015, nearly 78% of the Leitrim UAA is pasture, 12% is under commonage and just under 10% is rough grazing. Suckler cow and sheep are the main livestock system; most farms are under 50ha, with the average farm 25ha in size. Nature and farming co-exist over extensive areas in Leitrim, within a High Nature Value farming system – the rare and protected Marsh Fritillary butterfly can be found in grassland and heath which has plentiful Devil’s-bit Scabious, the food plant of the Fritillary caterpillar; maintenance of small fields and less intensive agriculture has led to retention of species diverse grasslands noticeably colourful in summer with pink Ragged Robin, yellow daisies and blue Forget-me-Nots; and hedges provide food and nesting areas for birds. 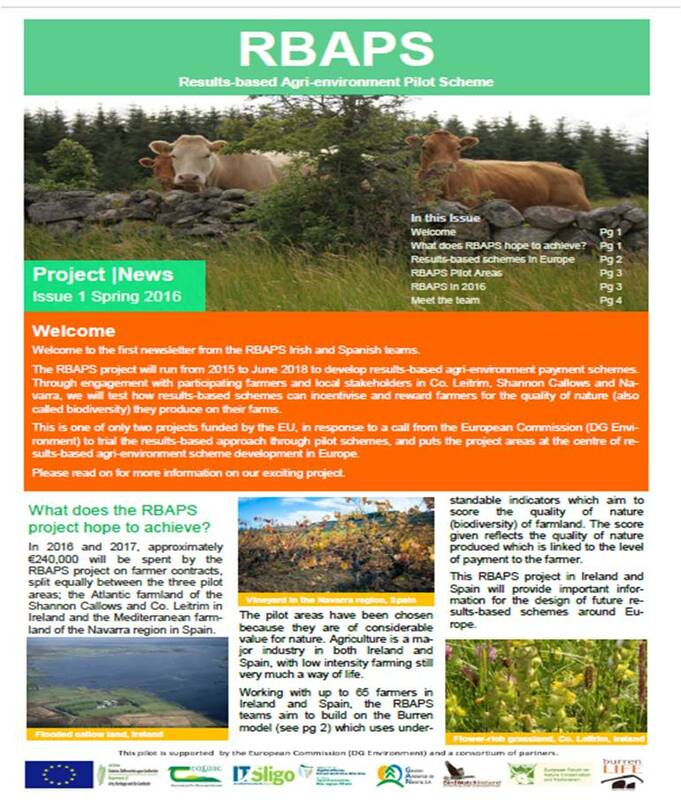 The RBAPS project offers an opportunity to explore innovative ways to maintain the extensive HNV farm system in Leitrim. 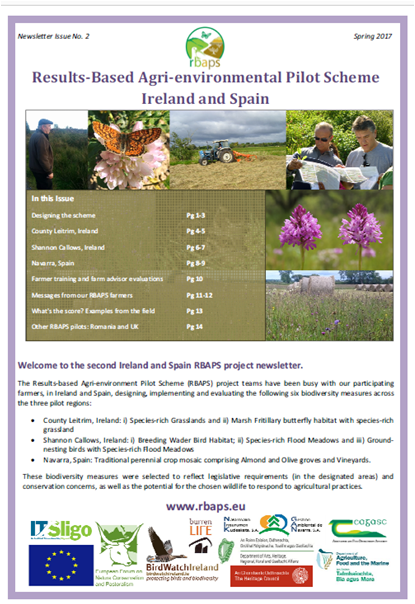 Rewarding farmers for biodiversity or public goods produced is not a new concept, but to date it hasn’t been widely applied in Europe (see the EU commissions RBAPS website for information on existing schemes). However, results based payment gives farmers the flexibility to use their own knowledge and experience to manage land in a way that benefits biodiversity, rather than being tied to top-down prescriptions. The Species-rich Grassland measure is designed to reward farmers for the quality of species-rich grasslands present on their land. Under this measure the number and cover of plant species which are indicators of good quality grasslands are assessed as part of the scoring system, along with indicators for current habitat condition. Spatial targeting was informed by Ireland’s national semi-natural grassland survey to ensure the measure was trialled on a number of soil types, representative as far as possible of the range of grassland types found in Ireland. 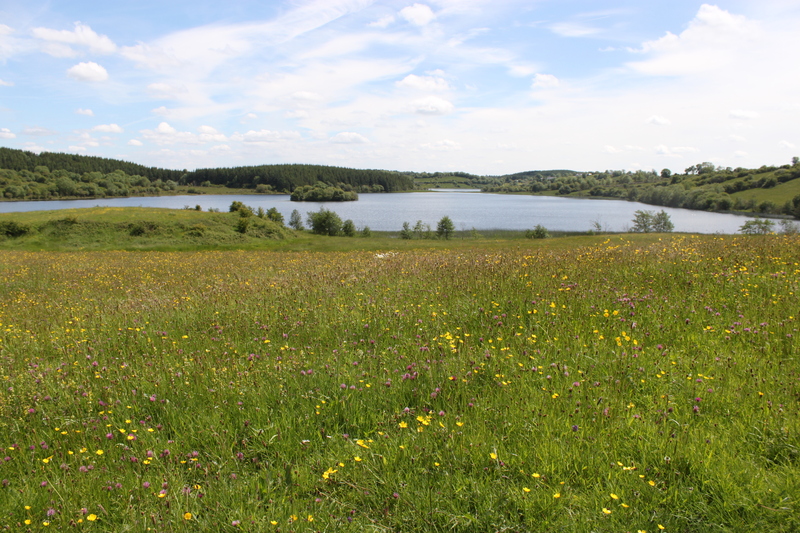 The Marsh Fritillary butterfly habitat and Species-rich Grassland measure rewards farmers for the condition of the habitat for Marsh Fritillary butterfly and the number and cover of plant species which are indicators of good quality grasslands. This measure was offered to participants where both previous records of Marsh Fritillary butterfly existed and there was sufficient cover of the butterfly’s food plant (Devil’s-bit Scabious, Succisa pratensis).